Chennai: Amity University Online (AUO), India’s most reputed online globaleducation platformand Devyani International Ltd (DIL), an associate company of RJ Corp and one of the fastest growing profitable players in the Indian retail food and beverage sector have signed a MOU today for offering digitally enabled business management degrees to their employees across India. The MOU signing ceremony took place between the management group of AUO and DIL. As per the memorandum of understanding, Amity University Online will be offering 2Yrs MBA & 3Yrs BBA or B.Com degree programme to over 10,000 employees of DIL, PAN India. 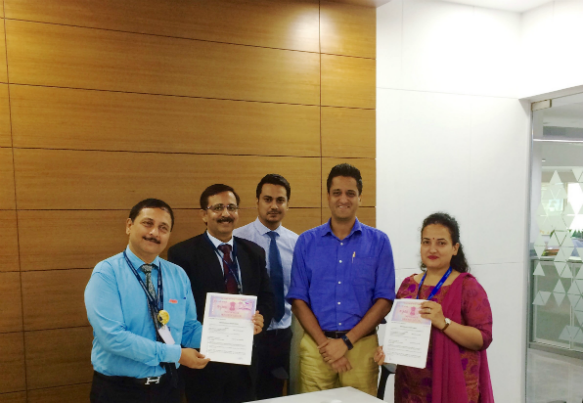 The MOU was signed in the presence of Mr. Taradutt Pathak, Chief Human Resources officer, Ms. Upasana Kashab, Sr. Manager- L&D and Amity Online team comprising of Prof. Abhinash Kumar,Jt. Director, Mr. Prem Das Maheshwari, Asst. director. With 17% annual growth rate, the fastest growing retail industry offers huge job opportunities to Indian workforce even with basic 12th education. But often after starting their career, they don’t get time to continue their education further. So to fill this gap, digitally enabled degree programmes allow them to pursue their graduation without losing their working status. AUO’s digitally enabled programmes will offer flexible learning environment to DIL employees to study at their own convenience while they are still working. With 100% digital delivery of content, assignments, projects,and examinations, the employees have freedom to study anytime-anywhere. For faster and easier enrollments, a dedicated personal-point of-contact will be allocated.Employees will also be benefited with significant fees savings compared to traditional campus programmes. The Business–Education partnerships have a positive impact on employees’ attitudes towards their work and ability to think& work critically and logically.On the one side employees who are given the opportunity to expand their education feel greater job satisfaction, have more advancement opportunities and experiencepersonal growth, the other side employers are able to achieve better employee retention with higher performing employees.